Please call the Transportation Line at 412.942.6157 between 7 a.m. and 3 p.m. to schedule transportation service. Scheduling is done on a first-come, first-served basis, although we make every effort to accommodate all requests. Please call 24 hours in advance of your appointment to schedule a ride. We regret any inconvenience to our patrons, but we are not able to accommodate wheelchair patients. Patients requesting Monday service should call the Friday prior to their scheduled appointment. The Transportation Office is closed Saturday, Sunday and all national holidays. The St. Clair Hospital Transportation Service operates Monday through Friday. Rides can be scheduled from 7 a.m. until 2 p.m.
We are not able to provide transportation service for patrons with appointments scheduled after 2 p.m. Return trip service, however, is guaranteed for any patient whose appointment is completed after that time. Patients are transported in one of six passenger vans. Each van is equipped with a cellular phone and a two-way radio, enabling the driver to remain in contact with the Hospital or our other facilities. All drivers are employees of St. Clair Hospital. Patients are picked up at their homes or at one of the St. Clair Hospital facilities, and are returned to their homes when their appointment or procedure is completed. To ensure that the service remains on schedule, we are only able to transport patients to a St. Clair Hospital facility or to their homes. Other stops cannot be accommodated. To guarantee on-time arrival and ensure that all patients arrive on time for their appointments, pick up times may have to be adjusted, and patients may occasionally experience up to an hour wait after their appointments or procedures are completed to be taken home. Patients waiting for a return ride at St. Clair Hospital should wait at the Main Entrance in the Fourth Floor Lobby or at the First Floor Entrance of the Professional Office Building. Patients waiting at any of the other locations should inquire at the Reception Desk as to where they should wait for the Transportation Service van. 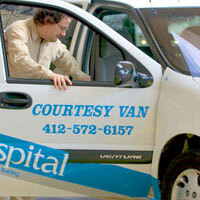 Please be certain to call the Transportation Line 412.942.6157 to notify us that you are ready for pick up service. Please note: Transportation Service drivers are not permitted to accept tips. We ask that in lieu of tips please make a donation to the St. Clair Hospital Foundation.